Many people think that most fires can be controlled by fire extinguishers. They are partly right, because the right kind of fire extinguishers can help you to deal with most fire situations. However, maintaining and using fire extinguishers requires the right kind of fire extinguisher training techniques. At Strategic Fire Solutions, we can help you with fire fighting training compliant with AS 3745-2010 under the Building Fire Safety Regulation Act 2008. A fire extinguisher is probably the first thing that comes to your mind when you see a fire. 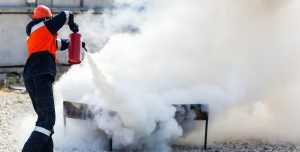 It is imperative that everyone at the workplace – from the owner to the employees, gets adept with fire extinguisher training techniques. However, a fire extinguisher is more than just a metal cylinder filled with fire fighting chemical solutions. Using a fire extinguisher with hose reels requires fire extinguisher training from an expert fire fighter. We make sure that everything related to fire fighting is adequately covered. Our professional guidance starts with assistance in installation and maintenance of fire extinguishers. We can also help you with choosing the right fire extinguishers for your commercial premises and identifying the most conspicuous locations for installing them. We provide thorough training to your staff for using the fire extinguishers in case of emergencies. At Strategic Fire Solutions, we cover every aspect of fire management and solutions. From fire fighting equipment installation to the most comprehensive fire management training for your staff, we make sure you have no cause for worry when it comes to preventing and managing fires at your workplace. We take care of the safety of your workplace while you can focus on your business. For a more detailed discussion about fire extinguishers and other related fire management solutions, call us at Strategic Fire Solutions right away! You will be glad you did!